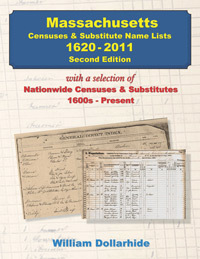 This new Second Edition includes 250 Massachusetts state URLs - of which 32 are catalog links. One hundred fifty are links to databases; sixty-five are links to FamilySearch digital captures. Three hundred thirty-five National URLs are also included. There are an additional 16 pages in the Second Edition (as compared to the First Edition). This book is also available in a soft cover printed book.